Yvonne and Fleur will lead you through a week that is sure to inspire and restore. All levels from Yoga beginners to experienced Yogis are welcome. Our signature Yoga and Culinary Retreat with Yvonne and Fleur is a really special one. If you want to unwind, feel deeply into your body and find out how to nourish your whole self with amazing vegan cuisine, while having lots of fun, this retreat is for you. Combining two of their greatest passions, food and yoga, Yvonne and Fleur will lead you through a week that is sure to inspire and restore. The daily yoga practice will help you to develop the ability to listen to the thoughts and feelings that are present, without getting caught up in them. Enjoy moving your body during dynamic morning classes, find balance in yoga poses with someone else in partner yoga, sing mantras at sunset and discover the healing quality of rest with restorative yoga. Whether you have been practicing yoga for many years or you are new to yoga; you are welcome! Fleur provides a safe environment and guides you through the classes in a light hearted, yet grounding way. When you’re not on your yoga mat, you are invited to join the series of culinary workshops that are unique to this retreat. Yvonne will share her passion for fresh-fusion, vegan cuisine and being creative in the kitchen. 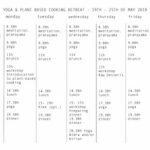 On this Retreat you’ll learn how to get started with plant based cooking, cook a whole plant based dinner and make raw vegan desserts, as well as being inspired by the dishes you indulge in every meal time. Good food is very important to us! We want to spoil and inspire you. In the last years we worked intensely on our culinary development. Passion and high standards are the main ingredients for our Retreat Menu. For the first time we will open our kitchen doors to give you an introduction to the plant- based world and to prepare a bunch of hand- picked recipes with you. This first workshop of the week will give you a starting point for your plant- based kitchen adventures. We will talk about the benefits of a plant- based choices and I will show you my favorite tools and tricks. I will introduce you to ingredients which are fairly common in the vegan world and we will start of this week with delicious spreads, dips and pestos. Try them with our freshly baked buckwheat bread. Desserts don’t have to be a guilty pleasure once you learn how to make raw desserts. They are nutrition rich, refined sugar and flour free, whole and real food which will make your heart and belly sing! You will be learning how to make quick and easy our infamous peanut butter cups, no- bake fudge as well as a raw cheese cake with a plenty of variation ideas. It would be a great time to ask question, mingle and be inspired by tasty treats. Get involved in the making of a whole dinner menu. You will be able to cook this dinner at home and of course we will provide a recipe booklet. All Workshops are demonstrations and some hands on participation. There will be plenty of deliciousness to try during the workshop or we will prepare dishes to enjoy afterwards all together. All ingredients are plant- based. Self-taught Retreat Chef Yvonne has been serving delicious delights to retreat guests at Yoga Spirit Circle for two years and is ready to let you into some of her most sort-after secrets! There are always healthy re-interpretations of classic dishes and favourite snacks such as peanut butter cups, pancakes and cheese cakes on Yvonne’s menus - and she will show you how to do the same. First transfer from Málaga Airprot to Casa Erica is at 12am, 3 times daily, optional and exclusive 20€ per person and direction. You can also take the bus (2 hours). Transfer from 8am til 12am, 20€.